Commercial outcomes drive the majority of business decisions. To be effective as designers, we must recognize this fact. Design is seen as many things by many people. It’s aesthetics. It’s structure. It’s functionality. It’s an outlet. It’s a process. It’s a cost center or maybe it’s a profit center. Regardless of the view, our job as “designers” is to engage in a design process that produces output. This output has to create real value for people. Enough value that “they’re” (the business and the business’s customers) willing to pay for it. The economics of design isn’t spoken about enough. It isn’t written about enough. And from my experience, it’s something that isn’t well understood by many design teams. Could you put a dollar figure to the impact each of your design decisions has? If you can’t, then the economics of design aren’t taken seriously enough within your organization. This is a big problem. But it can be solved. Wait? You’ve got to start with people. IDEO says start with desirability! In reality, this is not true. 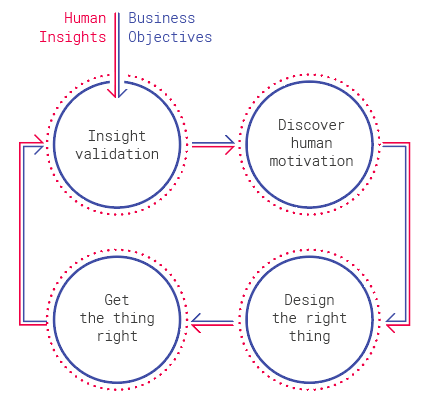 Design processes typically start with a business objective or series of insights. These serve as a frame of reference. Starting with the numbers doesn’t actually impact the process negatively. It doesn’t result in less human centricity. It does provide a foundation from which we can understand the business value our design process helps create. Once we have this foundation, we’re free to execute our human-centered design process. Here are 3 practical steps you can take to embed the economics of design into your organization. Onboarding is the best time to begin embedding commercial focus across design functions. In fact, if you can factor economics into the hiring process, you’ll be even better off. I’m not saying go into the depth you’d expect from David Skok. But, when you’re onboarding new people across the design function, they need commercial context. As an example, part of your onboarding may be pairing a new designer with an existing designer. Another part of the process may involve the new designer in some anthropological research. Or maybe you involve them in analyzing real-time quant to show how inferences from key event triggers you’re tracking impact design decisions. Each of these activities can have value. If the new team member asks the question, “How might this design hypothesis I/we have impact the commercial objective?” then your onboarding activities have likely been very successful. Commercial “awareness” is a great proxy in the early stages. 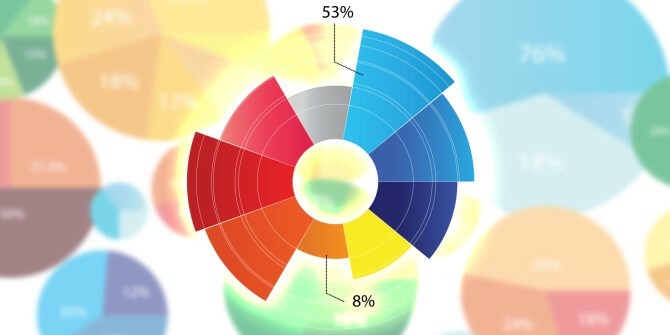 The specific activities you design to help build commercial awareness are up to you. My advice is to add a commercial layer to each of your existing activities. This is the simplest and least disruptive tactic. As an example, if your new recruit is paired with an existing team member, have the existing team member explain how the commercial objectives and unit economics impact her design hypotheses and process. This foundation will give all new recruits the commercial awareness they require to contribute to the sustainable operation of the design function. The design process and business function should be sustainable. It should justify its existence through strong ROI. For design leaders to do this, commercial focus must find its way into existing design processes. Formal design reviews are an incredible opportunity to factor economics into the design process. 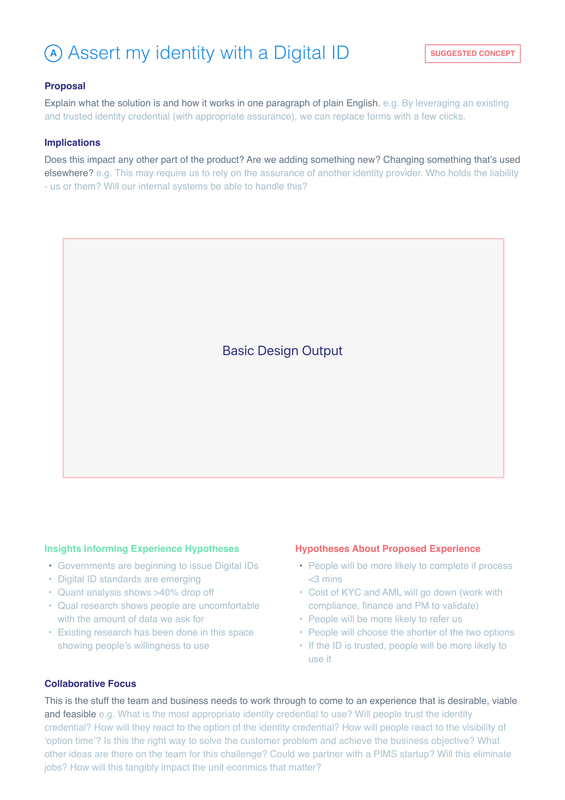 In fact, here’s a template you can use for your design reviews. It’ll help embed commercial focus into collaborative design activities. You can read more about how to use the template here. Design sprints can also be a deeply commercial activity. They’re an opportunity to engage cross-functional business stakeholders in the design process. They help build shared understanding and buy in from departments like finance, compliance and customer service—if done right. To achieve this, you’ll likely have to make a few changes to your design sprint process. Here are 3 changes that have worked particularly well for our team. Then there’s our daily process. 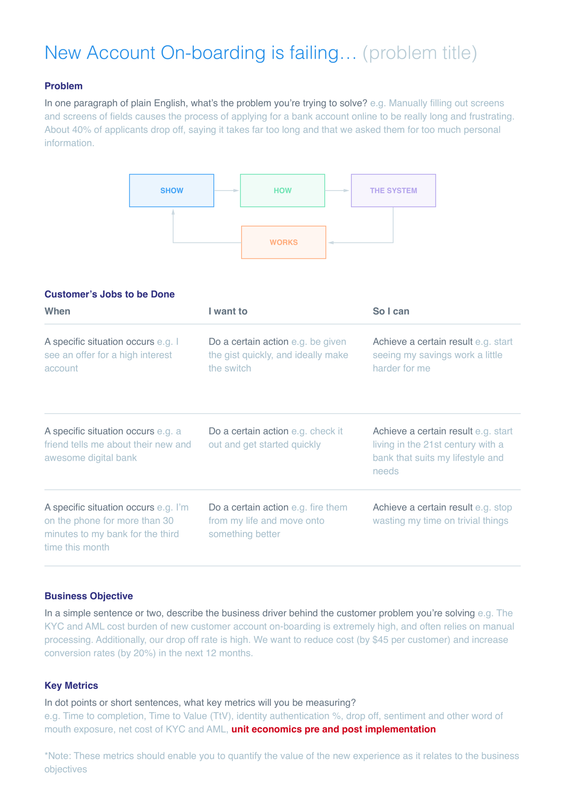 You might practice Lean UX. You may have miraculously found a way to embed research and design into a software development practice like Scrum. Or you might operate your own unique hybrid model. Regardless of the process you’re comfortable with, bring in that commercial lens to everything you do. This means justifying the commercial hypothesis associated with design hypothesis. It means balancing the needs of the business with the needs of customers. And it means viewing each and every interaction your product enables as an opportunity to create value for people, as well as extract value from them. Doing this only becomes possible if you have a means to quantify. What we measure matters. We know this. As an example, let’s say we’re focused on decreasing the Time to Value (TtV) for new users. We’ve designed an action-oriented progressive onboarding pathway that supports this objective. Maybe we’re even using something like Intercom to help with this process. From a commercial perspective, we need to understand the impact of TtV on the business. So, if we decrease the TtV by an entire day, what impact does it have? If a specific message is sent post a specific in-app activity, how does that impact the in-app purchase likelihood? We need to quantity this in dollars and cents for it to be meaningful. Our industry tends to be pretty good at defining usage success. We’re getting better and better at knowing how to support users along the pathway to usage success. We need to become equally as good at mapping usage success, and the real-life outcomes it supports, to business success. This is by no means one way. The business has to play ball too. In a simple example, imagine the business shared the insight that a 5% increase in retention nets somewhere between 20–100% greater profit. How might that impact your approach to design? How might that impact the relative priority of a design problem? In reality, the product we work on is the business. It’s the thing people see, feel, hear about, talk about, interact with, gain tangible value from and pay for. The people tasked with designing the product need to be acutely aware of what makes the business successful if they’re going to make the product successful. Right here, right now, there is a gap for a lot of teams. Gaps present opportunity. A focus on the economics of design will support the sustainability of the design function. It will support teams in justifying their existence and unique value. And it will actually support design output that leads to better human and business outcomes.